The exploration for renewable resources, certain requirements by specific ethnic communities, and rising environmental concerns have propelled the interest in utilizing plant-based raw materials for production of household consumer products. Demand for fabric softeners, a luxury product category, has increased manifold, with cationic surfactants being the major ingredient in these products. With the advent of advanced washing machines, which have distinctive automatic dispensers for fabric softener and detergent, demand for effective softeners that impart fragrance, softness, and ease of ironing to the laundry has surged significantly. Esterquats are cationic surfactants, increasingly utilized in light of their excellent biodegradability and softening effect compared to conventional quats. Albeit conventional quats deliver excellent softening performance, poor biodegradability of these quats coupled with stringent environmental regulations have curbed their adoption. This has further made esterquats the surfactant of choice among softener producers across the globe. With vegetable-based raw materials gaining worldwide acceptance over their animal-based counterparts, a new market niche has been created for fabric softeners, thereby stoking demand for esterquats. A recently composed research report of Transparency Market Research envisaged the global esterquats market to reflect an above-average expansion in the period of forecast (2017-2026). Revenues from global sales of esterquats are poised to reach roughly US$ 3,400 Mn by 2026-end. Textile industry is considered to be a major market for esterquats, as the industry is the global leading consumer of fabric softeners. Apart from fabric care applications, esterquats seek high usage in hair conditioners as anti-static in polymers, as well as in sanitizer products. There has been a surge in awareness about utilization of chemicals as fabric softeners, which help in maintaining texture and quality of fabrics. However these chemicals have been associated with several health effects such as irritation to skin and respiratory tract. This has further spurred use of plant-based raw materials in fabric softeners, which in turn is driving demand for esterquats. Growing penetration of technologically advanced washing machines, coupled with increasing purchasing power and changing lifestyles of consumers will also have a positive influence on demand for esterquats. Fabric care products are likely to prevail as the largest application of esterquats, in terms of revenue. Asia-Pacific excluding Japan (APEJ) will continue to endure as the fast-expanding as well as the largest market for esterquats, driven majorly by growing awareness and acceptance among consumers regarding use of environment-friendly products such as esterquats in manufacturing of fabric care and personal care products. Major manufacturers in APEJ are increasing focusing on the expansion of their plant capacities. Key companies such as Akzo Nobel are engaged in the capacity expansions for catering rapidly growing demand for esterquats in industrial applications. 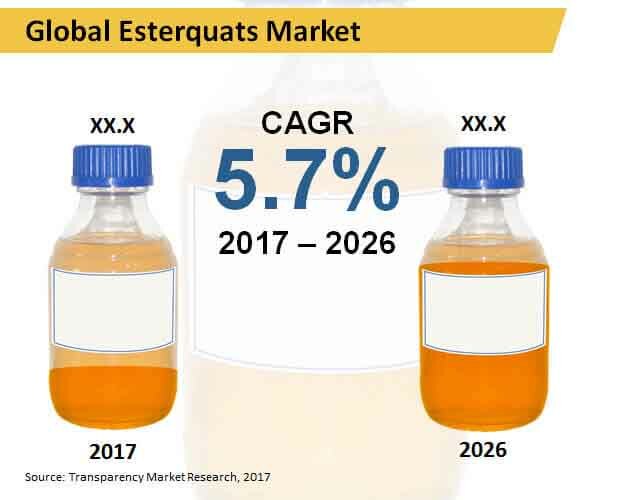 Although liquid esterquats will continue account for relatively larger revenue share of the market based on form, dry esterquats will witness the fastest sales expansion through 2026. Expansion of distribution channels has remained a key strategy employed by the players in the global esterquats market. A large number of industries are making investments for development of technologically advanced products. Extensive research & development efforts are being taken by esterquats manufacturers for enhancing the product’s efficacy and quality. Leading market players are entering into collaboration for developing novel products at competitive prices. For example, BASF collaborated with Solazyme Inc. for the development of first commercial surfactant based on micro-algae oil for home and personal care applications. The report profiles key players supporting growth of the global esterquats market, which include Chemelco International B.V., The Dow chemical company, Italmatch Chemicals S.p.A., Berkshire Hathaway Inc., Solvay Group, Stepan Company, Akzo Nobel, Kao Chemicals, and Evonik Industries. The report also offers detailed forecast on the market based on a segmentation analysis, which provides readers with deep understanding on sluggish as well as lucrative avenues for the esterquats market. The report segments the global esterquats market across an array of regions and segments viz. form, and application.